We have received some sad news this week. A beloved uncle has passed away. He was loved by every single life he touched. And believe me, he has touched many. His ability to love seemed too big for his own skin, so it spilled over and enveloped all those around him…and then some. He lived life to the fullest, and didn’t hold back when it came to the people he cared about. And it was in the littlest details where he touched people the most I think – a phone call to say hello, a visit to a niece’s volleyball game, a smile, a laugh, a printout of an interesting football article that he knew my husband would enjoy. I’ve realized, listening to his friends and family, that it is truly in the littlest details that we too can touch other people’s lives the most. Thoughtfulness, kindness, caring…a little goes a long way. So don’t be afraid to be generous. Just as he had a big appetite for life and love…he also had a big appetite for food. So tito E, this one’s for you. – Marinate your beef in the 2 tablespoons calamansi juice, 3 tablespoons soy sauce, garlic, and lots of freshly cracked black pepper. Make sure the marinade is mixed well and evenly distributed around the beef. Set aside for 30 minutes. – Heat a large skillet over high heat. You want all your meat to fit in a single layer. Add a couple of very generous glugs of olive oil to the pan. – Remove your meat from the marinade. Save the marinade for later. 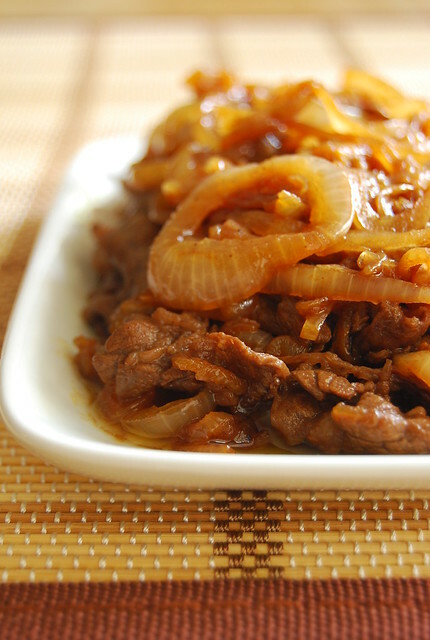 – When the oil is hot, add the beef to the pan, spreading so it cooks in a single layer. If you don’t have a pan big enough, cook the beef in batches. Fry quickly just until meat is almost done. Remove from the pan and set aside. – There may now be a bit of sauce in the bottom of the pan. Remove this and save for later. rapidly, tossing with the onions, to make sure the marinade cooks completely. Sometimes I like to add another drizzle of olive oil at this point. – Add the beef back in the pan, toss a few times, and then remove to a serving platter. Serve with steaming white rice! little crunch in them. So feel free to cook them as you like them. I’m also very generous with the black pepper…crack that pepper mill like you’re working out (as if I would really know what that feels like).We are leaving the city for the weekend. Summer is here and making us all yearn for childhood vacations, while our adult self is stuck in front of a computer screen the whole week. So we stuff our bags full of bathing suits and possibilities; pile ourselves, our spirits, and the Pack ‘N Play into our little red car; and head out to enjoy the sun whilst it shines, and each other most of all. Life is short, pick up that phone, connect, snuggle in bed a bit longer, let somebody else answer the phone while you watch your sleeping child.Love each other. We will miss you tito E.
UPDATES: I have since made this with anywhere from 250 to 600 grams of beef and it’s worked pretty well. Usually, if I want a little sweetness (not too much!) I add a little kecap manis to the marinade/sauce…I highly recommend it (I do this pretty much every time I cook bistek now)! Also, tried this with the sukiyaki-cut chuck roll (grade 6, 500 grams) of Kitayama Meatshop and it was amazing!! Oh Joey, so sorry to hear about your Uncle! My sympathies to you and your family for your loss. What a touching write-up, he would have loved this, I'm sure! I love Bistek! I've done it over here but had to use lemons in the absence of fresh calamansi. There is nothing like the real fresh flavors of calamansi to make this a real Filipino Bistek. Thanks for sharing the recipe! My sincerest condolences for your loss, Joey. I think your uncle would be so proud of you. Bistek is one of my comfort food. My aunt makes it the best and I love how it makes the whole house smell like lime and soy sauce lol. Condolences on your loss. This is a beautifully written post and a timely reminder of what is important in life. Thank you Gio…I agree that heaven just got another amazing person up there! Hi Betty Ann — thanks for your sympathies. A common lament of Filipinos abroad is that there is no calamansi for bistek! Have you tried growing it? I know one blogger that did. Hi Ling — Thank you. Hi Midge — Thanks…I hope so! Hi Marivic — Thank you. Yes, brings to fore what is most important beneath all the "noise" of daily life…must always remember! I had seen your tweet about working after receiving sad news, but didn't want to intrude. My condolences on the passing of a beloved relative. This is a lovely tribute to him and to the importance of letting our loved ones know exactly how much they mean to us on a daily basis. Thank you for sharing! Sorry to hear about the loss of your tito E, dear Joey. You obviously have lots of lovely memories to cherish.. Very well said Joey – am sorry to hear about your Tito. He would have been pleased with your tribute. Ok, this looks really interesting! I've printed it out and added it to my list of recipes to make really soon! Wow simply great! I love your blog. thank for this post. Thanks Trissa…I certainly hope so! Hi Grandma Kat – I hope you like it! Hi Sweethestia – Enjoy, it’s one of our staples! Hi i♥pinkc00kies – ours as well! Hi Frank, thank you and hope you enjoy this! Condolence. Hope this bistek comforted the soul, for it truly is a comforting dish. Hi Jen! I know…calamansi is one of those things we miss so much when we are abroad…such a distinct taste 🙂 Hope you like this!